Instead of lugging a laptop around, why not carry just the bits? I don't mean keeping your files on a USB key, or even booting from an external drive. I mean storing the entire "soul": the applications, data, OS and RAM image as a virtual machine you carry around on a portable drive. You could plug it into any sufficiently powerful host and resume your work without interruption . So, I tried it. My primary "computer" is a $25 USB flash drive that I plug into $2,500 dumb terminals. Note to OSX users: Apple does not want people running their operating system under virtualization. An OSX install disc will not normally boot under VMWare or Parallels. This policy is stupid and overbearing but I don't expect Apple to change, any more than I expect the control-freak leader of a hippie commune to loosen his grip on the bag of peyote buttons . I started off with a 4GB stick I had lying around and an Ubuntu Linux image running under VMWare. It was fine for browsing, code editing, etc, but was too space-constrained for real work. The total size of your virtual machine files will be the disk size + RAM size plus a few percent overhead. VMWare requires additional free space equal to your RAM size, presumably in order to write the contents of RAM to disk atomically during a "suspend". So a 2GB virtual machine image with 1GB of RAM allocated will require more than 4GB of space. This turned out to be a nice excuse to buy myself a 16GB stick. Setting up corporate effluent pipes (email, calendaring, VPN) on the VM would have taken more time than I wanted to spend, so I run them directly on the hosts. Make sure your desktop background, window themes, terminal colors, etc are different between your host and virtual machines so you don't get confused. Turn off the VM's screensaver. Use a pre-allocated disk. I made a single-file disk image instead of multiple 2GB chunks, but I have no idea if it makes a difference to speed or error-resistance. Running my Linux VM directly from a USB drive is smooth, contrary to expectations. I thought I would have to sync my machine image to the host machine's hard drive to get decent performance. I now put my computer in my pocket, commute to the office, plug in, and start working. Over lunch I hibernate the VM and make a backup to the host machine. If I need to work at home I plug it into my personal computer. The VM is slower than running directly on the host machine, but not by much unless you are doing disk-intensive work like compiling MacPorts. Video performance feels sluggish when scrolling or moving windows. A usable OSX image is too large for my USB drive but a cheap external hard drive works well enough. Next year 64GB USB and SD drives will be in the sweet spot. My work often requires testing on Windows inside other virtual machines, so I can't use all available RAM for my primary VM. There are minor UI annoyances like the host menubar popping up on OSX. A bug with the virtual sound system in VMWare seems to trigger a long-standing bug in OSX/Flash: YouTube videos play for a second then halt. 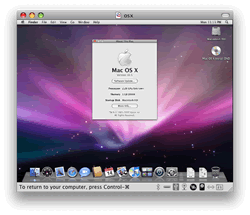 It would be nice to transform an existing OSX system into a virtual one. I believe you could back up your machine using CarbonCopyCloner or SuperDuper to a .dmg file, then use qemu-img to convert to a .vmdk or other virtual disk format. But unless you find a way to shrink the image you'd need a portable drive with a capacity larger than your current hard drive. The next big leap would be to replace the USB key with a real portable computer, something like the SmartQ5. The idea is to have one virtual machine that takes full advantage of whatever hardware it happens to be running on. Running a desktop-class virtual machine on a tiny device like would be extremely tricky if not impossible. Even leaving aside the different CPU, it's not possible (as far as I know) to change the amount of RAM or number of CPUs assigned to a VM without rebooting it. But I believe the hacks are out there, just waiting to be discovered. See Tom Hughes-Croucher's state vs sync and also the IBM SoulPad project from 2005. There are many ways to run OSX inside a VM, most of which are against the EULA in jurisdictions where the EULA is enforceable. The easiest way is to install a licensed generic copy of OSX (not the special model-specific copy that comes with Macs) on VMWare or Parallels, and then add some "special touches".